Death is feared, avoided, and denied in ways that often causes us to live as if we will never die. At the end of life, people often die with intense regret from not having done the important things they wanted to do in their life. Acknowledging the fact that we will die, and that we have a limited, unknown amount of time left is essential to making our life choices. By meditating on death in the proper way, we can make every moment of life precious and meaningful. A good death meditation results in a happy, clear mind, free of anxiety and fear. One learns to live each day of life as if it were the last, thereby avoiding meaningless activity and spending each moment in the most fulfilling way possible. This is an excellent meditation practice to develop a caring attitude in our hearts toward everyone in our lives, especially those that we have difficulty with. And it’s a wonderful meditation to do when one has an illness, to cultivate empathy, or to generate happiness. Tong Len practice cultivates love and compassion for ourselves, those we are indifferent toward, and those who harm us. It’s a great way to learn to be kind to yourself and others. This meditation practice focuses on understanding ultimate reality (emptiness) on a more advanced level. Mahamudra is a meditation on the ultimate nature of one’s own mind. We meditate on our mind, examining it on six different levels, each one leading to a more sophisticated understanding of our mind and it’s nature. Meditating on the ultimate nature of one’s own mind is an important part of a larger practice that leads to the direct perception of ultimate reality. The direct experience of ultimate reality is a key meditative realization that assures very quick enlightenment. Tucker Peck periodically teaches meditation retreats, which are the best way to deepen your practice. Retreats involve an extended period of Noble Silence, meaning that there’s very little talking, activity, or distraction. During these retreats, you will be able to maximize the amount of time each day that you spend meditating. Immediately following the Arya Nagarjuna Wisdom Retreat, Diamond Mountain offers an exclusive opportunity to experience 3 full days of supported solo retreat and enjoy the sweet and magical blessings of self-guided retreat. In this program, we will dive deeply into new practices as well as offer new ways of learning and engaging with this wisdom in our daily lives. As far as our original sources for this program, we will, of course, be using the most famous of all works by Arya Nagarjuna (c. 200AD)—which he named simply, Wisdom. This is considered the mother of all explanations of the crucial idea of emptiness. We will be depending heavily upon A Ship for Crossing the Ocean of Emptiness, a detailed commentary to the work by Choney Lama Drakpa Shedrup (1675-1748). 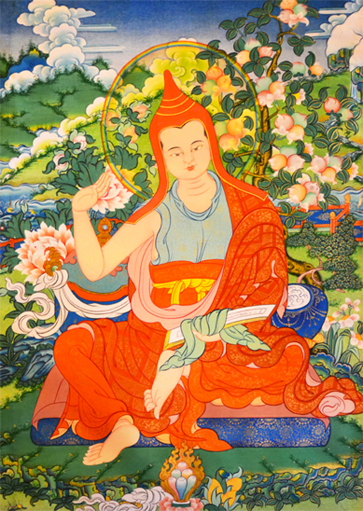 At times we will also check into his Commentary on the Difficult Points in “Wisdom,” and on occasion, we will venture into the deep forest of Je Tsongkapa’s extensive explanation, The Ocean of Emptiness—which as we can tell from the title alone forms the foundation for Choney Lama’s work. We will also be referring to the original Sanskrit version of Wisdom, which is fortunately still available. Immerse yourself in a spiritual lifestyle and Retreat Center life by participating in our Serve and Study Program. Allow the practice of selfless service to open your heart. Meet life-long friends. Learn to transform service into a spiritual practice. Immediately following the LAM RIM Retreat, Diamond Mountain offers an exclusive opportunity to experience 3 full days of supported solo retreat and enjoy the sweet and magical blessings of self-guided retreat. Take time to relax, rejoice, meditate and contemplate on what you have learned and how you have grown in 10 short days. Allow the teachings and realizations you’ve experienced in the past 10 days settle into your subconscious and transform your life in a very deep and powerful way. During the last two years, in silent retreats at Diamond Mountain Retreat Center, we’ve learned and meditated upon the great ideas of the Diamond Cutter Sutra. We’ve used the ancient Indian commentary of Master Kamalashila, with secrets that haven’t been explored for over a thousand years. – How do I build a Buddha paradise? – Is the Diamond Cutter Sutra a book, or an idea? – How can you write if the pen never touches the paper? – How did I help make the Buddha get enlightened before I even met him? – Should I say I know, when I do or say I don’t? Somewhere in the answers to all these questions is the key to getting everything we want in our life. We’ll explore the inside of our minds during the all-day retreat, following a daily, dawn session, exploring these questions. You’ll also learn new parts of the Lion’s Dance that we’ve never covered before to go deeper. Those who have received Vajrayogini empowerment through the lineage or Khen Rinpoche and Geshe Michael are welcome to join us at Diamond Mountain for a vow renewal ceremony. We’ll be doing a group self-initiation in the Main Temple on the evening of Saturday, January 13. Bring in the New Year with White Tara and Diamond Mountain Retreat Center. Grow your heart of compassion during our New Year’s Eve weekend Jenang (permission to practice) and Teachings on White Tara, the deity who bestows long and healthy life. Stay for the 5-day retreat led by David K. Stumpf, a humble practitioner of White Tara and author of “A compilation of advices on Tara’s practice”. During the retreat, you’ll receive additional commentary on White Tara’s sadhana practices and have time for personal retreat, reflection, and renewal. ACI Course 12 is the third in a three-part series based on “A Guide to the Bodhisattva’s Way of Life” (Bodhisattvacharya Avatara) by Master Shantideva (700 AD), and the commentary “Entry Point for Children of the Victorious Buddhas” (Gyalse Juk-ngok) by Gyaltsab Je (1364-1432). ACI Course 11 is the second in a three-part series based on “A Guide to the Bodhisattva’s Way of Life” (Bodhisattvacharya Avatara) by Master Shantideva (700 AD), and the commentary “Entry Point for Children of the Victorious Buddhas” (Gyalse Juk-ngok) by Gyaltsab Je (1364-1432). Join Tahiya Knapp, for the 2nd installation of the 3-part series on How to find more joy in your life. Listen to the recording of this course on youtube. In the fourth part of this course series, Master Kamalashila: Meditations on the Diamond Cutter Sutra, Geshe Michael Roach teaches the deepest meanings of ultimate reality and how to reach those states using a series of meditations from Master Kamalashila’s commentary. Each meditation is designed to increase and stabilize our understanding, step-by-step. This program is designed to inspire deep practice and contemplation. Each day, Geshe Michael will teach one class early in the morning, with healthy juices and food for a clear mind. Then, for the rest of the day, each participant will practice on their own in the solitude and beauty of the high desert of Arizona. This is the third in a four-part series based on Master Kamalashila’s commentary on the Diamond Cutter Sutra led by Senior Teachers. This retreat provided a unique opportunity to delve deeply into rarely taught meditations on emptiness. The retreat consisted of morning sessions followed by individual practice in the student’s private retreat cabin. In part three of this series, we cover the ACI Courses 11-15: Master Shantideva’s Guide to a Bodhisattva Way of Life – Parts 2 & 3, The Art of Reasoning, Lojong: Developing the Good Heart & What the Buddha Really Meant. On Wednesday, June 07th at 3 PM a wildfire caused by lightning broke out on a mountain near Diamond Mountain. Our calls to emergency services quickly led to a team of on-site professionals who helped us to manage the safety of our guests and staff who were all evacuated from the Retreat Valley. Wildfire-fighters from all over the Southwest worked quickly to extinguish the fire within 24 hours. Despite the quick response, part of our water system was damaged and a few houses received cosmetic damage. For more details, visit our Facebook posts from June 9, June 10, June 11 & June 13. For more information on this program, see our event page here. This is the third in a four-part series based on Master Kamalashila’s commentary on the Diamond Cutter Sutra led by Geshe Michael Roach. This retreat provided a unique opportunity to delve deeply into rarely taught meditations on emptiness. The retreat consisted of morning sessions led by Geshe Michael Roach followed by individual practice in the student’s private retreat cabin. This is the second in a four-part series based on Master Kamalashila’s commentary on the Diamond Cutter Sutra led by Senior Teachers. This retreat provided a unique opportunity to delve deeply into rarely taught meditations on emptiness. The retreat consisted of morning sessions followed by individual practice in the student’s private retreat cabin. Included a section from The Jewel of Realization, spoken by Lord Maitreya and written down by Arya Asanga describing the Buddha’s Marks and Signs, as well as a selection from A lamp Which Illuminates the Hidden Meaning composed of notes to a teaching by the great Konchok Tenpay Drunme of Gungtang, which explains the karmic correlations of the Buddha’s Marks and Signs. In the 25th installment of the series on the Steps to Enlightenment, we’ll be continuing through A Gift of Liberation by Pabongka Rinpoche, one of the greatest books ever written in Tibet. We’ve recently explored the idea of Taking Shelter, that is, where to go for ultimate protection when life gets hard. Now, we’re moving into how that protection roots us on the path to achieving ultimate happiness. By learning how karma works and revealing which actions bring about actual happiness and which actions do not, success and liberation become more readily attainable. Michael Dunn taught ACI Course 17: The Great Ideas of Buddhism – Part 2 of 3. The first weekend he covered ACI Courses 6-8: The Diamond Cutter Sutra, The Bodhisattva Vows, and Death and the Realms of Existence. The second weekend, Michael reviewed Death and the Realms of Existence, The Ethical Life and Master Shantideva’s Guide to a Bodhisattva Way of Life – Part 1. Did you miss this course? No problem, the audio files will be uploaded here for your enjoyment! Stay tuned for ACI 18: The Great Ideas of Buddhism – Part 3 of 3 with Ven. Gyelse in MARCH 2017! White Tara New Year’s Weekend Teachings and Retreat: Thank you so much to everyone who attended! We had such a lovely time studying, meditating, practicing yoga together. David Stumpf taught several Lam Rim classes over New Years weekend to prepare us for a lovely 21 Tara Ceremony on New Year’s Eve. After the ceremony, we enjoyed popcorn and sparkling apple cider as we planted a secret garden for 2017 with David and Sarahni Stumpf. The first week of the New Year was spent in retreat, receiving commentary on White Tara’s practice and studying and practicing her sadhana. We look forward to welcoming new faces next year! ACI Course 16: The Great Ideas of Buddhism – Part 1 of 3. This course reviewed material from the first five ACI Courses: The Principal Teachings of Buddhism, Buddhist Refuge, Applied Meditation, Proof of Future Lives, and How Karma Works. Thank you to everyone who attended, it was our pleasure to share these teachings with you! DMRC hosted “Master Kamalashila’s commentary on the Diamond Cutter Sutra” Retreat – Part 2. Master Kamalashila’s commentary on the Diamond Cutter Sutra part 2, led by Geshe Michael Roach. The second in a 4 part series based on Master Kamalashila’s commentary on the Diamond Cutter Sutra led by Geshe Michael Roach. This retreat provided a unique opportunity to delve deeply into rarely taught meditations on emptiness. The retreat consisted of morning sessions led by Geshe Michael Roach followed by individual practice in your own retreat cabin practicing. Geshe Michael included a section from “The Jewel of Realization”, spoken by Lord Maitreya and written down by Arya Asanga describing the Buddha’s Marks and Signs, as well as a selection from “A lamp Which Illuminates the Hidden Meaning” composed of notes to a teaching by the great Konchok Tenpay Drunme of Gungtang, which explains the karmic correlations of the Buddha’s Marks and Signs. October 14-23, 2016 DMRC hosted ACI’s 10-day “Gift of Liberation Retreat”. Based on the great Tibetan Classic, A Gift of Liberation: Thrust into the Palm of Our Hand written by Pabonka Rinpoche, this retreat focused on using death meditation to reinvigorate your life and your practice and included the popular 3-day “Retreat within a Retreat”. This 10-day installment finished the portion of the text describing the animal and hell realms, included a beautiful death meditation and began the section of the Lam Rim which discusses the beautiful practice of going for refuge. DMRC hosted “Master Kamalashila’s commentary on the Diamond Cutter Sutra” Retreat – Part 1. A review of this incomparable course where we delve into Kamalashila’s rarely taught commentary on the Diamond Cutter Sutra. Interwoven into this teaching is a review of the conducive conditions for meditation, the top 5 problems in meditation and their 8 antidotes and numerous meditations for stillness. This review course will be led by a group of Geshe Michael’s students who have completed 3 years of meditation retreat: John Brady, Connie O’Brien, Michael Dunn, and Melissa Buschey. THANK YOU JOYFUL VOLUNTEERS!! David, we enjoyed working and visiting with you! John and Joe, thank you for generously offering your time and company! Venerable Gyelse, our Operations Manager and a small crew of volunteers spent the weekend creating a more robust water supply for 4 of our Retreat Valley cottages. It was a pleasure to share the work, the dinners and connect. We rejoice in the memories! March 18-27, 2016 DMRC hosted ACI’s 10-day “Gift of Liberation Retreat”. Based on the great Tibetan Classic, A Gift of Liberation: Thrust into the Palm of Our Hand written by Pabonka Rinpoche, this retreat focused on using death meditation to reinvigorate your life and your practice and included the popular 3-day “Retreat within a Retreat”. March 28- April 3, 2016, DMRC hosted “Master Kamalashila’s commentary on the Diamond Cutter Sutra” Retreat. The first in a 4 part series based on Master Kamalashila’s commentary on the Diamond Cutter Sutra led by Geshe Michael Roach. This retreat provided a unique opportunity to delve deeply into rarely taught meditations on emptiness. The retreat consisted of morning sessions led by Geshe Michael Roach followed by individual practice in your own retreat cabin practicing. A 10-day international retreat intensive featuring teachings, yoga, dance, three days of silent retreat, and two beautiful weddings! We also celebrated the grand opening of the new Je Tsongkapa Student Center. Hosted by the Asian Classics Institute. A fun weekend prepping for the upcoming October ACI Retreat — the largest retreat we’ve hosted yet! Pictures from the weekend are on ACI’s Facebook. Construction is complete on our new student center, and some local friends came to celebrate! Check out our Facebook page for some pictures from that afternoon and photographs of the new center. A 10-day international retreat intensive with teachings, yoga, stargazing, and 3 days of silent, personal retreat. Hosted by the Asian Classics Institute. A 10-day international retreat intensive hosted by the Asian Classics Institute. For more information on this program, see the event page here.